Cement Americas provides comprehensive coverage of the North and South American cement markets from raw material extraction to delivery and tranportation to end user. www.cementamericas.com • Spring 2018 • CEMENT AMERICAS 33 FEATURE While these emotions are understandable, it's important to remind employees that their value is in their knowledge and experience. Incorporating new technologies is a meth- od of augmenting that experience – not replacing it – and the data supports this claim. Census data collected since 1871 in England and Wales illustrates that the incorporation of technology has resulted in a net gain of jobs, not a loss. Compiled by Deloitte, the study indicates that machines excel at repetitive tasks but don't appear to have gotten any closer to eliminating the need for human labor. Instead, technology makes existing employees more effi- cient and gives them the ability to spend their time on more critical tasks that robots can't perform, such as strategiz- ing and making important decisions. 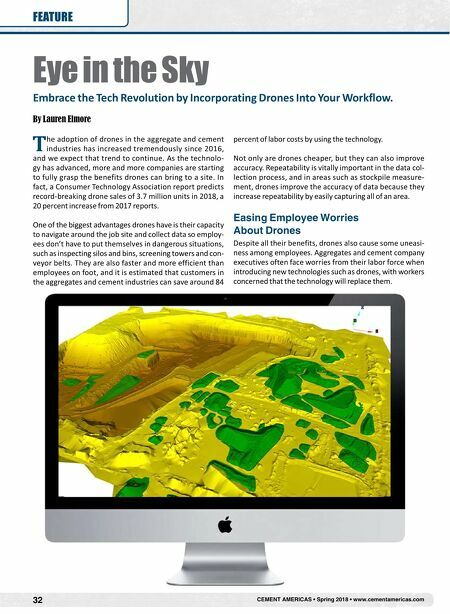 Incorporating drone usage into your workflows is a great example of how aggre- gate executives can use technology to improve efficiency while keeping their most valuable asset out of harm's way. To start, follow these three steps: 1. Partner With a Service Company A reputable provider will take the service side of drone implementation very seriously. Implementing a new tech- nology and the required systems can be daunting, so having a service provider there to train employees, answer ques- tions, and give demonstrations and walkthroughs can't be overstated. 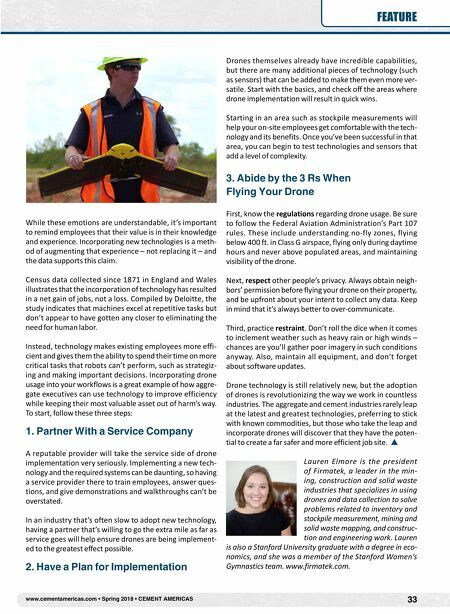 In an industry that's often slow to adopt new technology, having a partner that's willing to go the extra mile as far as service goes will help ensure drones are being implement- ed to the greatest effect possible. 2. Have a Plan for Implementation Drones themselves already have incredible capabilities, but there are many additional pieces of technology (such as sensors) that can be added to make them even more ver- satile. Start with the basics, and check off the areas where drone implementation will result in quick wins. Starting in an area such as stockpile measurements will help your on-site employees get comfortable with the tech- nology and its benefits. Once you've been successful in that area, you can begin to test technologies and sensors that add a level of complexity. 3. Abide by the 3 Rs When Flying Your Drone First, know the regulations regarding drone usage. Be sure to follow the Federal Aviation Administration's Part 107 rules. These include understanding no-fly zones, flying below 400 ft. in Class G airspace, flying only during daytime hours and never above populated areas, and maintaining visibility of the drone. Next, respect other people's privacy. Always obtain neigh- bors' permission before flying your drone on their property, and be upfront about your intent to collect any data. Keep in mind that it's always better to over-communicate. Third, practice restraint. Don't roll the dice when it comes to inclement weather such as heavy rain or high winds – chances are you'll gather poor imagery in such conditions anyway. Also, maintain all equipment, and don't forget about software updates. Drone technology is still relatively new, but the adoption of drones is revolutionizing the way we work in countless industries. The aggregate and cement industries rarely leap at the latest and greatest technologies, preferring to stick with known commodities, but those who take the leap and incorporate drones will discover that they have the poten- tial to create a far safer and more efficient job site. Lauren Elmore is the president of Firmatek, a leader in the min- ing, construction and solid waste industries that specializes in using drones and data collection to solve problems related to inventory and stockpile measurement, mining and solid waste mapping, and construc- tion and engineering work. Lauren is also a Stanford University graduate with a degree in eco- nomics, and she was a member of the Stanford Women's Gymnastics team. www.firmatek.com.